Lineweight is the visual thickness of lines. The use of lineweight is critically important to maintaining good legibility and professional appearance in drawings. See this post for general information on lineweight. Lineweight is the visual thickness of lines. The use of lineweight is critically important to maintaining good legibility and professional appearance in drawings. Discerning objects cut by a plane. Relatively heavy lineweights (e. g. in excess of 0.5 mm) are usually used to designate objects cut by a plane. For example, in a plan drawing, a lineweight of 0.5 mm might designate walls and columns; in a section drawing, the same lineweight might designate floors, walls, and the ground. Discerning changes in observable planes. Relatively medium lineweights (e. g. 0.3 mm or so) are usually used to designate objects observed against a background. For example, in a plan drawing, a lineweight of 0.3 mm might designate a countertop, an item of furniture, stairs, a balcony edge, and so on; in a section or elevation drawing, the same lineweight might designate the outline or edge of a wall against a distant wall, or an opening in a wall. 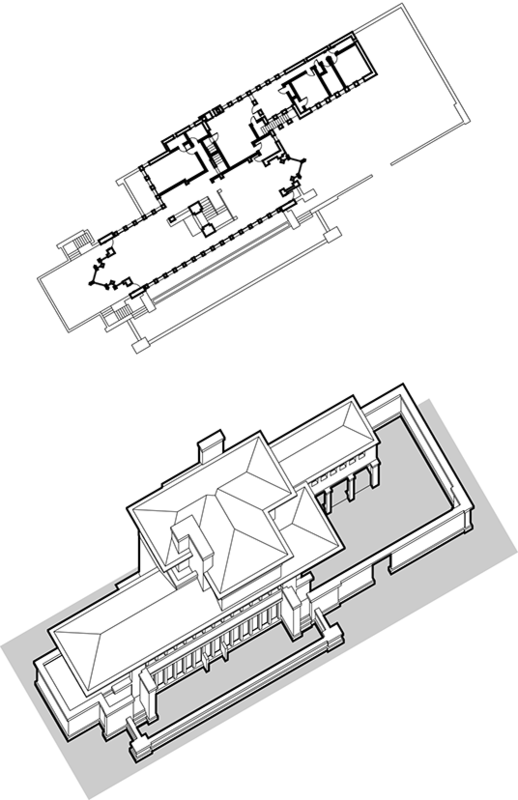 In an axonometric drawing (such as the one of the Robie House to the left), a medium or heavy line might outline solid objects against a background. Discerning changes in material occurring on a single plane. Relatively thin lineweights (e. g. less than .1 mm) are usually used to designate changes in material occurring on a single plane. For example, in a plan drawing, a lineweight of less than 0.1 mm might designate a threshold at a door, or the spring point of a ramp; in a section or elevation drawing, the same lineweight might designate trim around a door or window. Designating material or texture. The thinnest possible lineweight (0 mm) is often, though not exclusively, used for hatch patterns in plans, sections, and elevations. Note that 0 mm does not indicate “no line”; rather, it indicates the thinnest line producible by the selected output device. In AutoCAD, lineweight is an object property, meaning that every object in an AutoCAD drawing can be assigned its own lineweight. By default, every object is assigned the ByLayer lineweight, meaning that the object assumes the lineweight assigned to its layer. Like any object property, this can be overridden on an object-by-object basis. It’s considered good practice to use layers to organize object lineweight, rather than setting object lineweight on a per-object basis. In other words, unless there is a compelling need to do otherwise, always keep AutoCAD object lineweight set to ByLayer. 2. Type LAYER to bring up the Layer Properties Manager palette. 3. Click on the layer whose properties you wish to change. 4. Choose the desired linetype or lineweight. All objects in this layer with the BYLAYER property set for linetype or lineweight will inherit these settings.